Outside the weather was cold and grey but inside Sox towers the fire was roaring and the place was warm. The sound of a kenwood mixing machine was coming from the kitchen and the aroma of baking hung in the air. It’s been a while since Mrs Sox and I have had a day to relax and do our thing. I on the one hand like to mess around with makeup and Mrs Sox likes to do her baking. I had quite a few ideas on clothes combinations to try and I always like to mess around with eye makeup. Even though most the time I end up either looking like I have two black eyes or look like a demented panda. Just as I have got the bedroom looking like we have been burgled and I am trying to decide on which pair of heels to try on next, the call comes from the kitchen. 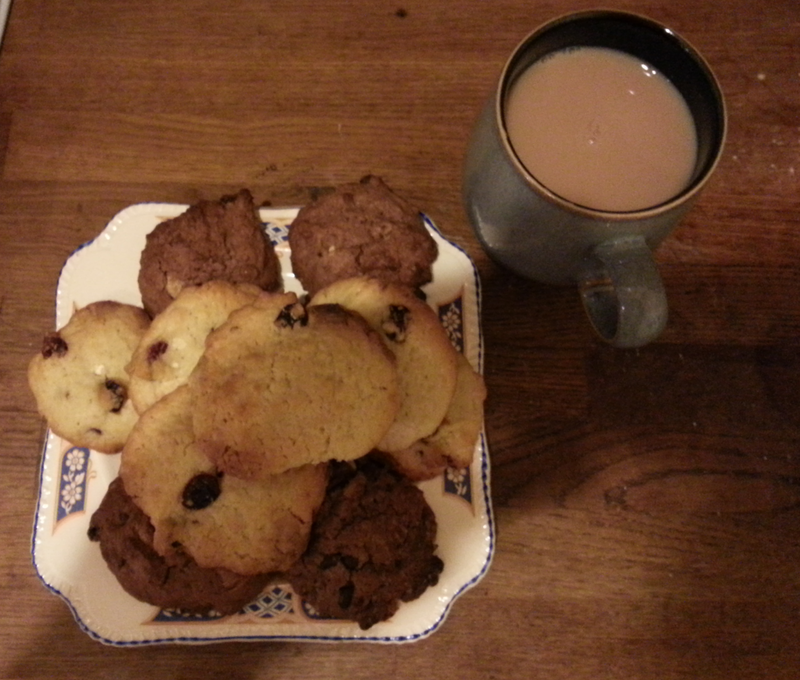 The first batch of cookies is ready to sample and the kettle is on. The lip gloss lost the battle with the cookies and my mug was empty. It was one of those times when you go to take another sip of tea and you realize you have drunk it all…..never mind. It won’t be long till the second batch of cookies is ready. Mmmmm chocolate ones next.